Cloud Providers represent the infrastructure of your applications. Typically, a Cloud Provider is mapped to a Kubernetes cluster, AWS account, Google service account, Azure subscription, or a data center. You add cloud providers to your Harness Account and then reference them when defining deployment environments. Click Setup, and then click Cloud Providers. Click Add Cloud Provider. The Cloud Provider dialog appears. In Type, select the type of cloud provider you want to add. The dialog settings will change for each cloud provider. In Display Name, enter the name that you will use to refer to this Cloud Provider when setting up your Harness Application, such as GCP Cloud. You will use the Display Name when setting up Harness Environments, Service Infrastructures, and other settings. Enter the cloud provider account information, and then click SUBMIT. Once you have created Harness applications and environments, you can return to this dialog and add Usage Scope on which applications and environments may use this cloud provider account. Below you will find account details and Harness permission requirements for the different providers. Please ensure that the account used to add the Cloud Provider to Harness has the permission requirements listed below. When the Kubernetes cluster is created, you specify the authentication methods for the cluster. 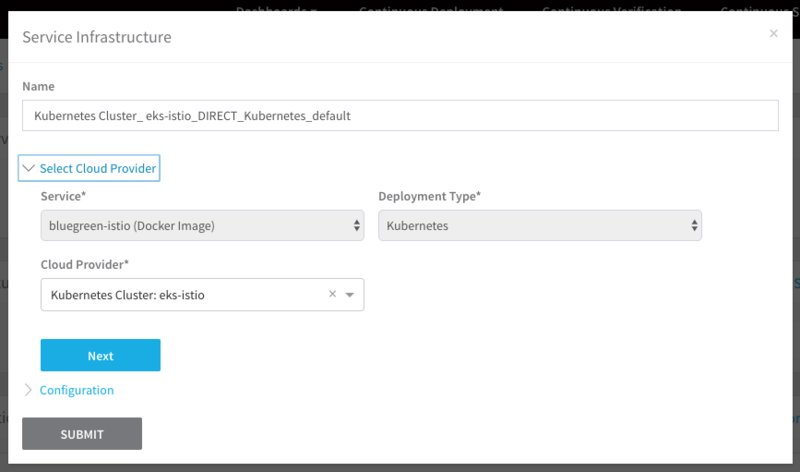 You can use these methods to enable Harness to connect to the cluster as a Cloud Provider for the deployment service infrastructure. For more information, see Authenticating from Kubernetes. 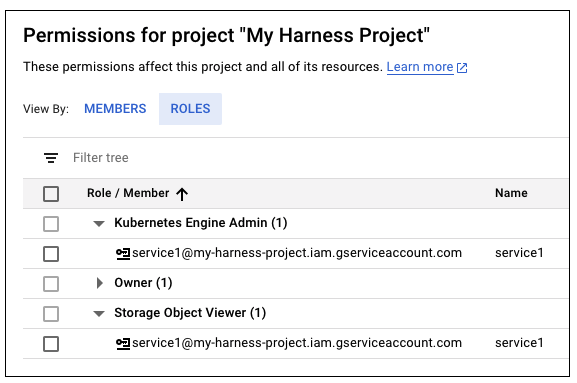 Recommended: Install and run the Harness Kubernetes Delegate in the GKE Kubernetes cluster, and then use the Kubernetes Cluster Cloud Provider to connect to that cluster using the Harness Kubernetes Delegate you installed. This is the easiest method to connect to a Kubernetes cluster. For more information, see Installation Example: Google Cloud Platform. When you choose Kubernetes Cluster in Type, the cloud provider dialog changes for the Kubernetes Cluster settings. The authentication strategy for the Kubernetes cluster is used to fill in the dialog. Inherit Cluster Details from selected Delegate. Use this option if you installed the Harness delegate in your cluster. This is the common method for Amazon EKS. CA certificate, client certificate, and client key. Key passphrase and key algorithm are optional. The Kubernetes Cluster dialog has the following fields. Recommended. Select this option if the Kubernetes cluster is the same cluster where the Harness delegate was installed. This is the common method for Amazon EKS. If you use this option, the service account you use must have the Kubernetes cluster-admin role. Select the tag of the Delegate. For information on adding tags to Delegates, see Delegate Installation. In the case of some Kubernetes providers, such as OpenShift, the delegate should be installed outside of the cluster. The Kubernetes master node URL. Username and password for the Kubernetes cluster. For example, admin or john@example.com, and a Basic authentication password. Paste in the Certificate authority root certificate used to validate client certificates presented to the API server. For more information, see Authenticating from Kubernetes. Paste in the client certificate for the cluster. The client certificate may be used in conjunction with or in place of Basic authentication. The public client certificate is generated along with the private client key used to authenticate. The certificate can be pasted in either Base64 encoded or decoded. Paste in the client key for the client certificate. The key can be pasted in either Base64 encoded or decoded. Paste in the client key passphrase. The passphrase can be pasted in either Base64 encoded or decoded. Specify the encryption algorithm used when the certificate was created. Typically, RSA. Paste in the service account token for the service account. The token must be pasted in decoded. The following shell script is a quick method for obtaining the service account token. Run this script wherever you run kubectl to access the cluster. Set the SERVICE_ACCOUNT_NAME and NAMESPACE values to the values in your infrastructure. Enable this option during creation of this cloud provider only. When you create a service infrastructure as part of your Harness setup, Harness will need to validate. Until Harness has a specific namespace for the Kubernetes cluster, it tries to validate in the default namespace. If you have a cluster without a default namespace, or the credentials entered in this dialog do not have permission in the default namespace, you can enable validation initially. When you click SUBMIT, Harness uses the provided credentials to list controllers in the default namespace in order to validate the credentials. If validation fails, Harness does not save the cloud provider and the SUBMIT fails. If your cluster does not have a default namespace, or your credentials do not have permission in the default namespace, then you can check Skip Validation to skip this check and saving your cloud provider settings. You do not need to come back and uncheck Skip Validation. Later, when you later create a service infrastructure using this cloud provider, you will also specify a specific namespace. Harness uses this namespace rather than the default namespace. When Harness saves the service infrastructure it performs validation even if Skip Validation was checked. A Kubernetes service account with permission to create entities in the target namespace. The set of permissions should include list, get, create, and delete permissions for each of the entity types Harness uses. In general, cluster admin permission or namespace admin permission is sufficient. When you use the Same cluster as Kubernetes delegate option (an in-cluster delegate) or the Kubernetes Service Account Token setting, Kubernetes RBAC applies. The service account you use must have the Kubernetes cluster-admin role. For more information, see User-Facing Roles from Kubernetes. For more information about Kubernetes and Harness, see Kubernetes and Harness FAQ. AWS EKS is supported using the Same cluster as Kubernetes delegate option in the Kubernetes Cluster cloud provider settings. Install a Harness Kubernetes delegate in your EKS cluster. Give it a name that you can recognize as an EKS cluster delegate. For information on installing a Kubernetes delegate, see Delegate Installation. Add a tag to the Delegate in Harness. To learn more about Delegate tags, see Delegate Installation. In Type, click Kubernetes Cluster. Click the Inherit Cluster Details from selected Delegate checkbox to enable it. In Delegate Name, select the Kubernetes Delegate you installed in the EKS cluster. You are selecting the Delegate tag name. Using the EKS-based environment in a workflow is no different than using any Kubernetes cluster. You simply select the Environment as part of setting up the workflow. OpenShift is supported through an external delegate installation (shell script installation of the delegate outside of the Kubernetes cluster) and a service account token, entered in the Kubernetes Service Account Token field. 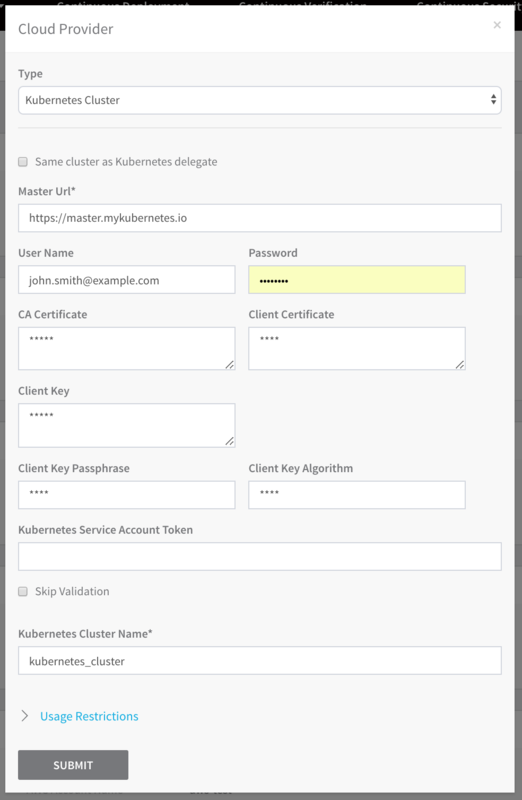 You only need to use the Master URL and Kubernetes Service Account Token fields in the Kubernetes Cloud Provider dialog. Once configured, OpenShift is used by Harness as a typical Kubernetes cluster. The token does not need to have global read permissions. The token can be scoped to the namespace. The Kubernetes containers must be OpenShift-compatible containers. If you are already using OpenShift, then this is already configured. But be aware that OpenShift cannot simply deploy any Kubernetes container. You can get OpenShift images from the following public repos: https://hub.docker.com/u/openshift and https://access.redhat.com/containers. For information on installing the delegate, see Delegate Installation. When you choose Google Cloud Platform in Type, the Cloud Provider dialog changes for the GCP settings. Open the IAM & Admin page in the GCP Console. Select your project and click OPEN. In the left nav, click Service accounts. Look for the service account for which you wish to create a key, and click the service account name. In Service account details, click EDIT. Select a Key type and click Create. For more information, see Creating and Managing Service Account Keys from GCP. 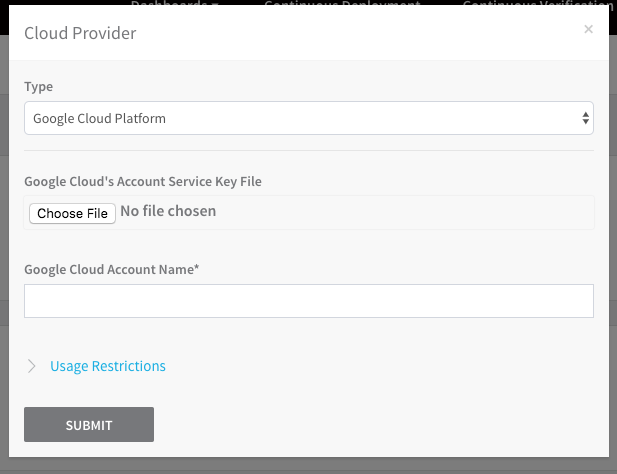 Upload the key file into the Harness Cloud Provider dialog. The Google Cloud Account Name field is automatically populated with the account name, but you can enter a new name. Click SUBMIT. The GCP cloud provider is added. The GCP service account requires Kubernetes Engine Admin (GKE Admin) role to get the Kubernetes master username and password. Harness also requires Storage Object Viewer permissions. For steps to add roles to your service account, see Granting Roles to Service Accounts from Google. For more information, see Understanding Roles from GCP. AWS is used as a Harness Cloud Provider for obtaining artifacts, deploying services, and for verifying deployments using CloudWatch. Recommended: Install and run a Harness Delegate (ECS Delegate in an ECS cluster, Shell Script Delegate on an EC2 instance, etc) in the same VPC as the AWS resources you will use, and then use the Delegate for the AWS Cloud Provider credentials. This is the easiest method to connect to AWS. For more information, see Delegate Installation and Management. 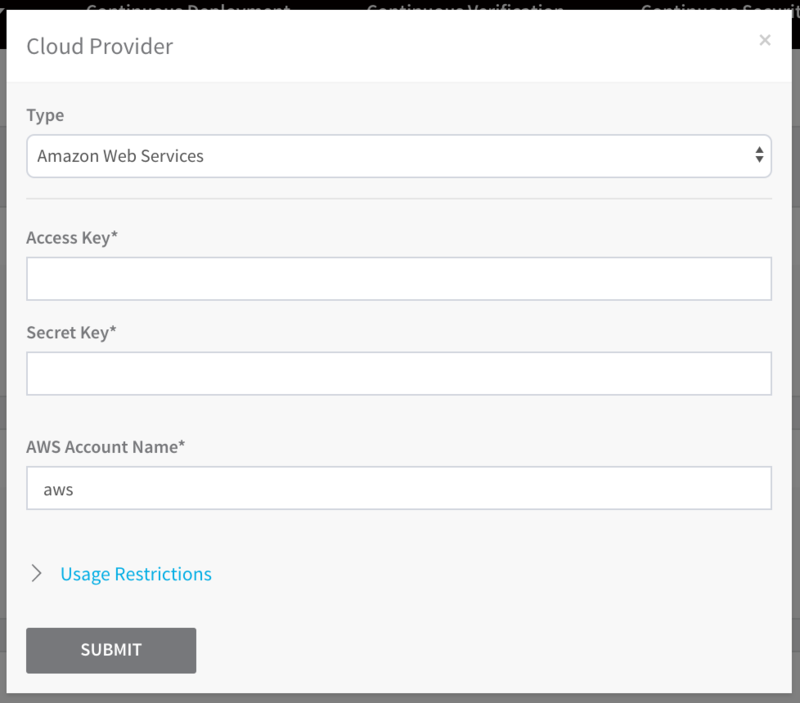 When you select Amazon Web Services in Type, the Cloud Provider dialog changes for the AWS settings. Enter your Access Key and your Secret Key. For more information, see Access Keys (Access Key ID and Secret Access Key) from AWS. Choose a name for this provider. The name is to differentiate AWS providers in Harness. It is not the actual AWS account name. User: Harness requires the IAM user be able to make API requests to AWS. For more information, see Creating an IAM User in Your AWS Account from AWS. User Access Type: Programmatic access. This enables an access key ID and secret access key for the AWS API, CLI, SDK, and other development tools. Description: Provides read-only access to Amazon EC2 Container Registry repositories. Description: Provides read-only access to all buckets via the AWS Management Console. Recommended: Install and run the Harness ECS Delegate in the ECS cluster, and then use the AWS Cloud Provider to connect to that cluster using the Harness ECS Delegate you installed. This is the easiest method to connect to a ECS cluster. For more information, see Installation Example: Amazon Web Services and ECS. Ensure that you add the IAM roles and policies to your ECS cluster when you create it. You cannot add the IAM roles and policies to an existing ECS cluster. You can add policies to whatever role is already assigned to an existing ECS cluster. The Managed Policy AmazonEC2ContainerServiceforEC2Role from AWS. The Customer Managed Policy you create using Application Auto Scaling. Attach both of these policies to the ecsInstanceRole role, and apply that to your ECS cluster when you create it. For information on ecsInstanceRole, see Amazon ECS Instance Role from AWS. Description: Makes calls to the Amazon ECS API. For more information, see Amazon ECS Container Instance IAM Role from AWS. Policy Name: This is a customer-managed policy you must create. In this example we have named it HarnessECS. There is a limit on how many policies you can attach to a IAM role. If you exceed the limit, copy the permissions JSON under Action, create a single custom policy, and add them to the policy. Due to an AWS limitation, Harness is unable to limit the three actions for ECS to Create, Update, and DeleteService for just a specific cluster/resource. This limitation is why we require Resource *. ECS with Public Docker Registry: Both ECS permissions are required. ECS with Private Docker Registry: Both ECS permissions are required. Also, the Docker agent on the container host should be configured to authenticate with the private registry. Please refer to AWS documentation here. ECS with ECR: For ECS and ECR, both sections permissions are required. ECS with GCR: This is currently not supported. For Auto Scaling, the AWS Managed policy AWSApplicationAutoscalingECSServicePolicy should be attached to the default ecsInstanceRole role, and applied to your ECS cluster when you create it. For information on AWSApplicationAutoscalingECSServicePolicy, see Amazon ECS Service Auto Scaling IAM Role from AWS. For information on ecsInstanceRole, see Amazon ECS Instance Role from AWS. Description: Describes your CloudWatch alarms and registered services, as well as permissions to update your Amazon ECS service's desired count on your behalf. There are two policies required: AWSCodeDeployRole and AWSCodeDeployDeployerAccess. Description: Provides CodeDeploy service access to expand tags and interact with Auto Scaling on your behalf. Description: Provides access to register and deploy a revision. The following policy is for Elastic Load Balancer, Application Load Balancer, and Elastic Container Service. Description: Default policy for Amazon ECS service role. Notes: Make sure the Trust Relationship is properly set for the role. Refer to AWS documentation here. Description: Provides full access to Amazon EC2 via the AWS Management Console. Newly created roles under Amazon EC2 have trusted entities listed as ec2.amazonaws.com. For ECS, this needs to be updated with ecs.amazonaws.com. See the AWS documentation at Amazon ECS Service Scheduler IAM Role. When you choose Microsoft Azure in Type, the Cloud Provider dialog changes for the Azure settings. The Microsoft Azure dialog has the following fields. This is the Client/Application ID for the Azure app registration you are using. It is found in the Azure Active Directory App registrations. For more information, see Quickstart: Register an app with the Azure Active Directory v1.0 endpoint from Microsoft. To access resources in your Azure subscription, you must assign the Azure App registration using this Client ID to a role in that subscription. Later, when you set up an Azure service infrastructure in a Harness environment, you will select a subscription. If the Azure App registration using this Client ID is not assigned a role in a subscription, no subscriptions will be available. For more information, see Assign the application to a role from Microsoft. The Tenant ID is the ID of the Azure Active Directory (AAD) in which you created your application. This is also called the Directory ID. For more information, see Get tenant ID from Azure. Authentication key for your application. This is found in Azure Active Directory, App Registrations. Doubleclick the App name. Click Settings, and then click Keys. You cannot view existing key values, but you can create a new key. For more information, see Get application ID and authentication key from Azure. Azure has previewed a new App Registrations blade that displays keys in the Certificates & secrets tab, under Client secrets. For Azure Container Repository (ACR): The Client ID (Application ID) must be assigned to a role that has the Reader permission on the resource group of the ACR container. This is the minimum requirement. For Azure Kubernetes Services (AKS): The Client ID (Application ID) must be assigned to a role that has the Owner permission on the AKS cluster. If you are using the Kubernetes Cloud Provider and the Kubernetes Delegate in the AKS cluster, then AKS permissions are not required at all. This is recommended. When you choose PCF in Type, the Cloud Provider dialog changes for the PCF settings. The PCF dialog has the following fields. Enter the API endpoint URL, without URL scheme. For example, api.run.pivotal.io. Omit http://. For more information, see Identifying the API Endpoint for your PAS Instance from Pivotal. Username and password for the PCF account to use for this connection. Provide a unique name for this connection. You will use this name to select this connection when creating a service infrastructure for your deployment. In Usage Scope, click the drop-down under Applications, and click the name of the application. In Environments, click the name of the environment. PCF user account with Admin, Org Manager, or Space Manager role. The user account must be able to update spaces, orgs, and applications. For more information, see Orgs, Spaces, Roles, and Permissions from Pivotal. When you choose Physical Data Center in Type, the Cloud Provider dialog changes for the Physical Data Center settings. For a Physical Data Center Cloud Provider, no credentials are required. Instead, you add an SSH secret in Harness Secrets Management, and select that later in your Harness Environment in Connection Attributes. For more information, see Secrets Management.